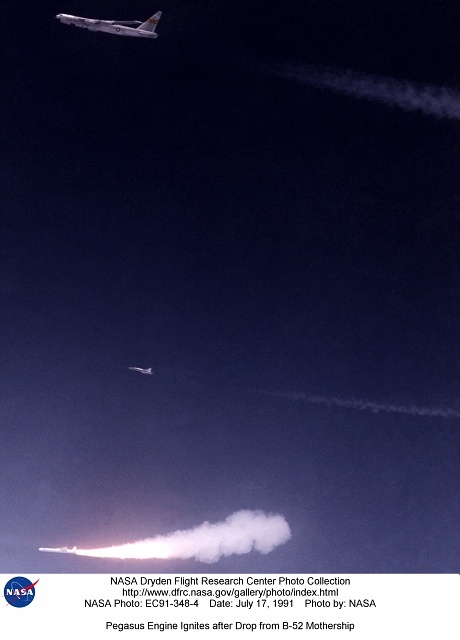 Against the midnight blue of a high-altitude sky, Orbital Sciences’ Pegasus winged rocket booster ignites after being dropped from NASA’s B-52 mothership on a July 1991 flight. A NASA chase plane for the flight is also visible above the rocket and below the B-52. Pegasus is an air-launched space booster produced by Orbital Sciences Corporation and Hercules Aerospace Company (initially; later, Alliant Tech Systems) to provide small satellite users with a cost-effective, flexible, and reliable method for placing payloads into low earth orbit. Pegasus has been used to launch a number of satellites and the PHYSX experiment. That experiment consisted of a smooth glove installed on the first-stage delta wing of the Pegasus. The glove was used to gather data at speeds of up to Mach 8 and at altitudes approaching 200,000 feet. The flight took place on October 22, 1998. The PHYSX experiment focused on determining where boundary-layer transition occurs on the glove and on identifying the flow mechanism causing transition over the glove. Data from this flight-research effort included temperature, heat transfer, pressure measurements, airflow, and trajectory reconstruction. Hypersonic flight-research programs are an approach to validate design methods for hypersonic vehicles (those that fly more than five times the speed of sound, or Mach 5). Dryden Flight Research Center, Edwards, California, provided overall management of the glove experiment, glove design, and buildup. Dryden also was responsible for conducting the flight tests. Langley Research Center, Hampton, Virginia, was responsible for the design of the aerodynamic glove as well as development of sensor and instrumentation systems for the glove. Other participating NASA centers included Ames Research Center, Mountain View, California; Goddard Space Flight Center, Greenbelt, Maryland; and Kennedy Space Center, Florida. Orbital Sciences Corporation, Dulles, Virginia, is the manufacturer of the Pegasus vehicle, while Vandenberg Air Force Base served as a pre-launch assembly facility for the launch that included the PHYSX experiment. NASA used data from Pegasus launches to obtain considerable data on aerodynamics. By conducting experiments in a piggyback mode on Pegasus, some critical and secondary design and development issues were addressed at hypersonic speeds. The vehicle was also used to develop hypersonic flight instrumentation and test techniques.